Some people believe milk is dangerous like Kryptonite, and they go to heroic lengths to avoid it. But the truth is as long as you aren’t made of steel – or from another planet – you can benefit a great deal from daily consumption. There’s a lot of contradictory information flying around about whether or not milk is good for you, but in reality, people have been relying upon milk for high quality nutrition for a very long time, and lots of good quality science confirms its value. But like all things nutrition and health, context is important, and it’s possible to react badly to milk (often only temporarily), even if ironically milk is one of the best things to consume, to help improve your health. It can be a bit of a conundrum. Most of the time the reason for bad reactions is because of different things that are added into milk, or because of problems arising due to the consumption of other ingredients in your diet, interfering with digestion. Sometimes it’s just because of the particular diet of the cow, or because you have a poorly functioning metabolism and inflammation. There are a number of studies attached below which go into more detail about ‘lactose intolerance’. All that aside for now, when it comes to promoting health, or for protection against the effects of stress on metabolic function, I think milk is more important today than it has ever been. Why would I say such a thing? The simple answer is that the world has changed significantly over the last century. The concept of stress has taken on a whole new meaning, very different to what still comes to mind for many people, when that word is used. Polyunsaturated fat (PUFA) consumption, radiation, environmental estrogens, toxic chemicals, heavy metals, dangerous pharmaceuticals, the wrong kind of light, sleep issues and numerous other harmful things have a cumulative stress promoting, metabolism interfering effect, that likely has never been seen before. Anti-sugar hysteria makes things significantly worse. These things, especially when added together, promote increasing levels of chronic inflammation, and thyroid and energy metabolism dysfunction. And they promote them in such a way as to be able to prevent ease of return to normal function when stress reduces. If you put the idea of ‘genes’ as the cause of all problems aside, you’ll discover that degeneration and disease is always at the very least, exacerbated by stress, inflammation and thyroid dysfunction. Once you are already suffering from the effects of ongoing stress, including chronic inflammatory issues and suppressed energy system function, your ability to assimilate the nutrition necessary for healing is interfered with, and your food options can be limited. If you want to recover from or avoid illness, there are a number of reasons why you have less of a choice these days, but to include milk in your diet. Milk is a fairly easily digestible, high calcium, high protein, low iron, reasonably low phosphorus food, with milk sugar (lactose), mostly saturated fat, and a variety of vitamins and minerals. This is a really good thing when it comes to protection against stress and inflammation. The calcium in milk is almost enough of a reason not to go without milk in your diet. The importance of calcium can hardly be overstated. Calcium is an anti-inflammatory, anti-stress, anti-obesity, anti-allergy, pro-metabolism substance. Insufficient calcium can cause PTH (parathyroid hormone) to rise, which pulls calcium out of the bones into circulation causing an excess of calcium inside cells. Even though calcium plays a crucial role in cellular metabolism, improper regulation of calcium is central to stress, inflammation and disease. Sufficient calcium intake helps keep PTH low, ensuring the vast majority of calcium stays in the bones, and the amount of calcium required to be in the cell remains properly regulated for optimal metabolic performance. High PTH is itself an issue which promotes inflammation and disease. PTH stimulates the production of inflammatory cytokines, inhibits oxidative metabolism, and encourages the production of lactic acid instead of carbon dioxide, pumping up stress. Rising PTH has been shown to increase cancer, diabetes, obesity, heart disease, hypertension and all cause mortality. There are some other ways to get sufficient calcium, however there is evidence showing that calcium in milk or dairy is the easiest to assimilate, a factor which is likely to become even more important as stress rises, metabolism is suppressed and the digestive system is inflamed and sub-optimal. Alternative sources of calcium often worsen digestive irritation and may end up adding to the severity of high PTH, inflammatory, calcium dysregulation issues, rather than achieving their anti-stress objective. I’m not saying it isn’t doable, but it may not be ideal at a time when the right results can be crucial. Being able to satisfy nutritional requirements as easily as possible, with food that is highly palatable, removes another layer of stress getting in the way of the potential to avoid inflammatory conditions, or heal from illness. Apart from being very high in calcium, milk provides quality protein, and protein deficiency is another thing which causes PTH to rise, suppresses liver function and thyroid energy metabolism, and generally increases stress, inflammation and disease. Ironically, thyroid dysfunction and inflammation can interfere with the ability to digest protein, making it hard for some people to fix a protein deficiency by eating protein. There are some good ways to approach this (potato juice and BCAAs for example) but in many cases, lowering stress and inflammation and improving liver function is a reasonable idea. A large amount of the protein in milk is casein, which has been shown to have anti-inflammatory protective effects. Apart from milk and dairy, no other protein source that I am aware of, offers as much easy to digest, easily assimilable protein, whilst at the same time being low in iron, low enough in phosphorus and high enough in calcium (to help maintain a good phosphorus to calcium ratio), and low in pufa. This all goes a long way towards making milk one of the best foods around. Excess iron, too much phosphorus (relative to calcium), and the over consumption and storage of PUFA, are three of the most biologically relevant and scientifically backed drivers of chronic inflammation, stress, aging and disease. Limiting the impact of these issues has been demonstrated to reduce many kinds of symptoms, and to improve recovery from illness. Grains, beans, nuts, seeds, legumes, meat and many vegetables all have at least one (and in some cases all) of the above mentioned problems, and it looks like none of these foods, on their own can provide calcium and protein as safely and effectively as milk. Am I saying they can never be part of a healthy diet or that eating any of them means you can’t ever be healthy? No I’m not. It is true that milk protein has some tryptohan content, and that particularly as a person gets older, it’s a good idea to limit intake if possible, as it has the potential to be inflammatory and to be converted into the stress substance, serotonin. The good news however, is that tryptophan is more likely to be converted into niacin than serotonin, if stress is low, thyroid is functioning well, polyunsaturated free fatty acids are minimized, progesterone to estrogen ratio is good, and calcium to phosphorus ratio is optimized. Thankfully milk is a great food when it comes to achieving all these objectives. So milk gives you lots of protein and calcium, minus issues associated with iron, too much phosphorus, and excess PUFA. When it comes to thyroid energy system metabolism, this is a bit like winning the lottery. And there’s more. Milk also comes equipped with its own sugar, lactose, and there are a number of reasons why this is helpful. One reason is that it has been shown that lactose increases calcium absorption, and that this is true even when there is a deficiency of lactase. The sugar or lactose content in milk is another factor which can be understood to provide energy and protect against stress, increasing carbon dioxide production, reducing free fatty acids, keeping PTH low and improving calcium regulation. Sugar, by lowering stress, can also help to reduce calcium requirements. Stress reduction is beneficial for disease in general, and this includes weight loss and blood sugar related issues. Milk consumption has been shown to lower cortisol, helping to minimize the release of the inflammatory amino acids (including tryptophan) into circulation. The combination of milk and sweet fruit (or milk with added sugar) can be a great way to minimize negative effects from amino acids (including the possible low blood sugar effects of protein). The addition of gelatin or glycine into the diet can also be protective against any inflammatory effects from excess tryptophan. It appears that casein may also be able to protect against tryptophan absorption. There is plenty of science which demonstrates that ‘lactose intolerance’ symptoms can be dealt with by fixing inflammatory thyroid related digestive issues, and that small amounts of milk with food or with added sugar can almost always be tolerated, and symptoms can completely go away over time. In my experience, removing inflammatory things and gradually increasing your intake of pro-metabolic foods over time is an effective way to lower stress and get rid of digestive issues that interfere with the assimilation of milk. Perhaps milk cannot work like a ‘superfood’ until the real Kryponites are dealt with. Bacterial endotoxin (LPS) is a major factor driving inflammation and metabolic suppression, and endotoxin becomes more of an issue as a result of calcium dysregulation and protein insufficiency, and all the other things that go along with and promote chronic stress and thyroid issues. PUFA, iron and endotoxin powerfully interact causing or worsening inflammatory issues (including diabetes and metabolic syndrome) and milk is a very helpful food to replace the foods that are largely responsible for increasing the likelihood of these interactions. High fat intake in general can interfere with energy metabolism, and the fat, (which stores some beneficial nutrients) is also the place of storage for toxins and heavy metals. Skim milk has been shown in some studies to protect against disease more than whole milk, and it’s worthwhile experimenting with the lower fat milks (especially as you age) to avoid excess PUFA and other problematic things, if you are consuming large quantities everyday. Estrogen levels in milk (especially low fat milk) are minimal, and they are counteracted by good quantities of progesterone. Even if this were not the case, it would still be a non-issue in comparison to the estrogenic effects of high iron, high PUFA, high phosphorus, low calcium, low protein, digestion interfering, bacteria feeding, liver overloading foods that replace milk and some other dairy foods. There is very little way around this that I know of, and the addition of sugar or sweet fruit to a milk based diet also helps to protect against estrogen excess, as well as free fatty acid release, serotonin, endotoxin, cortisol, calcium dysregulation, and inflammation in general. I’m not saying that milk is the be all and end all solution to every health problem, but I haven’t seen any evidence that has convinced me that removing dairy from your diet, and eating green veggies and flax seed oil is a good idea when it comes to chronic stress and inflammation. Milk makes meeting nutritional requirements simple, and the last thing anybody needs when they are sick, is to spend their days trying to make difficult to digest things palatable and digestible. Chocolate milk with lots of sugar or with coffee is easy and delicious. Milk also comes with other pro-metabolism anti-stress anti-inflammatory things like magnesium, potassium, B-12 and riboflavin, but even milk is not a perfect solution in today’s environment. And diet is not the only factor determining health outcomes, so things can get a little confusing if it’s assumed that all people who have longevity are eating an optimal diet. Studies are unable to control for every variable. Milk has always been a good food, but there is good reason to suggest that the way things are today, it may be more important than ever. Regardless, milk can differ from one cow to the next (for many reasons), and metabolic conditions vary. Experimentation with different kinds, and with diet in general, is fundamental. I often hear it said that ‘milk is meant for baby cows’, but all this does is make me wonder if seeds are meant for baby birds, or if leaves are meant for squirrels and moose. 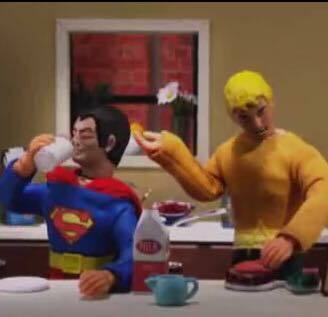 There’s a reason why Aquaman isn’t able to leap tall buildings in a single bound. The effect of feeding different sugar-sweetened beverages to growing female Sprague-Dawley rats on bone mass and strength. Dietary fructose or starch: effects on copper, zinc, iron, manganese, calcium, and magnesium balances in humans. Regulation of bone mass by serotonin: molecular biology and therapeutic implications. Effect of dietary calcium: Phosphorus ratio on bone mineralization and intestinal calcium absorption in ovariectomized rats. Milk and dairy consumption and risk of dementia in an elderly Japanese population: the Hisayama Study. Dietary calcium and dairy products modulate oxidative and inflammatory stress in mice and humans. Previous milk consumption is associated with greater bone density in young women. Bone turnover, calcium homeostasis, and vitamin D status in Danish vegans. Milk consumption and bone mineral density in middle aged and elderly women. Milk, rather than other foods, is associated with vertebral bone mass and circulating IGF-1 in female adolescents. Dairy food consumption, blood pressure and stroke. Children who avoid drinking cow milk have low dietary calcium intakes and poor bone health. Milk products, dietary patterns and blood pressure management. Digestion and absorption of casein at different dietary levels in the chick: effect on fatty acid and bile acid absorption. Proposed role of calcium and dairy food components in weight management and metabolic health. Protection of adrenocortical activity by dietary casein in ether anaesthetized rats. Glycemia and insulinemia in healthy subjects after lactose-equivalent meals of milk and other food proteins: the role of plasma amino acids and incretins. Low dairy calcium intake is associated with overweight and elevated blood pressure in Polish adults, notably in premenopausal women. Dairy Products, Dietary Calcium, and Risk of Inflammatory Bowel Disease: Results From a European Prospective Cohort Investigation. The effect of milk supplements on calcium metabolism, bone metabolism and calcium balance. Dairy products, dietary calcium and bone health: possibility of prevention of osteoporosis in women: the Polish experience. Low calcium:phosphorus ratio in habitual diets affects serum parathyroid hormone concentration and calcium metabolism in healthy women with adequate calcium intake. Anti-Inflammatory and Antioxidant Properties of Casein Hydrolysate Produced Using High Hydrostatic Pressure Combined with Proteolytic Enzymes. Effects of lactose on calcium absorption and secretion by rat ileum. Milk intake during childhood and adolescence, adult bone density, and osteoporotic fractures in US women. Association between hypothyroidism and small intestinal bacterial overgrowth. Calcium absorption from milk in lactase-deficient and lactase-sufficient adults. Inhibition of bone turnover by milk intake in postmenopausal women. Dietary calcium intake in patients with inflammatory bowel disease. Increased calcium intake does not completely counteract the effects of increased phosphorus intake on bone: an acute dose-response study in healthy females. The survival advantage of milk and dairy consumption: an overview of evidence from cohort studies of vascular diseases, diabetes and cancer. Dairy Consumption Lowers Systemic Inflammation and Liver Enzymes in Typically Low-Dairy Consumers with Clinical Characteristics of Metabolic Syndrome. Associations between dairy foods, diabetes, and metabolic health: potential mechanisms and future directions. Milk intake and bone mineral acquisition in adolescent girls: randomised, controlled intervention trial. Parathyroid hormone may be a cancer promoter – an explanation for the decrease in cancer risk associated with ultraviolet light, calcium, and vitamin D.
Lifetime milk consumption and bone mineral density in older women. Should dairy be recommended as part of a healthy vegetarian diet? Point. Metabolic endotoxemia with obesity: is it real and is it relevant? Parathyroid hormone, cardiovascular and all-cause mortality: A meta-analysis. Dietary calcium: adequacy of a vegetarian diet. The effect of milk supplementation on bone mineral density in postmenopausal Chinese women in Malaysia. Dietary intake of dairy products, calcium, and vitamin D and the risk of hypertension in middle-aged and older women. Dietary calcium and magnesium intake and mortality: a prospective study of men. Changes in markers of inflammation, antioxidant capacity and oxidative stress in smokers following consumption of milk, and milk supplemented with fruit and vegetable extracts and vitamin C.
Dairy consumption and the incidence of hyperglycemia and the metabolic syndrome: results from a french prospective study, Data from the Epidemiological Study on the Insulin Resistance Syndrome (DESIR). Lactose: a milk-specific carbohydrate enabling homeostatic regulation of glucose and insulin. Dietary linoleic acid suppresses gene expression of rat liver alpha-amino-beta-carboxymuconate-epsilon-semialdehyde decarboxylase (ACMSD) and increases quinolinic acid in serum. High calcium diet improves the liver oxidative stress and microsteatosis in adult obese rats that were overfed during lactation. Calcium, nitric oxide, and preeclampsia. Dairy products consumption is associated with decreased levels of inflammatory markers related to cardiovascular disease in apparently healthy adults: the ATTICA study. Effect of dairy consumption on weight and body composition in adults: a systematic review and meta-analysis of randomized controlled clinical trials. Dairy consumption and risk of type 2 diabetes mellitus: a meta-analysis of cohort studies. Dairy consumption, obesity, and the insulin resistance syndrome in young adults: the CARDIA Study. A systematic review and meta-analysis of elevated blood pressure and consumption of dairy foods. Effect of leucine on intestinal absorption of tryptophan in rats. Milk consumption and bone mineral content in Chinese adolescent girls. School-milk intervention trial enhances growth and bone mineral accretion in Chinese girls aged 10-12 years in Beijing. Benefits of milk powder supplementation on bone accretion in Chinese children. Effects of dairy compared with soy on oxidative and inflammatory stress in overweight and obese subjects. Dairy consumption and CVD: a systematic review and meta-analysis. Colonic adaptation to daily lactose feeding in lactose maldigesters reduces lactose intolerance. Systematic review: effective management strategies for lactose intolerance. Subjective perception of lactose intolerance does not always indicate lactose malabsorption. A comparison of symptoms after the consumption of milk or lactose-hydrolyzed milk by people with self-reported severe lactose intolerance. Tolerance to the daily ingestion of two cups of milk by individuals claiming lactose intolerance. Lactose intolerance symptoms assessed by meta-analysis: a grain of truth that leads to exaggeration. Improved lactose digestion during pregnancy: a case of physiologic adaptation? Milk nutritional composition and its role in human health. [Meta-analysis of the relationship between dairy product consumption and gastric cancer]. Dairy consumption and gastric cancer risk: a meta-analysis of epidemiological studies. Role of dietary calcium and dairy products in modulating adiposity. Milk consumption and bladder cancer risk: a meta-analysis of published epidemiological studies. Dairy products and the risk of type 2 diabetes: a systematic review and dose-response meta-analysis of cohort studies. Previous story Are You Running On Empty?